Why is natural play important for children?What is “loose parts play” all about? What’s the big deal with wooden toys? Aren’t pegdolls and random bits of wood a bit plain and simple for my child’s sophisticated intelligence? Loose parts and natural play seem to be very much the “in thing” these days. But what’s all the fuss about? I wanted to know these answers when I first came across natural wooden Montessori and Steiner toys such as the Ostheimer type simple wooden animals. I was comparing them with detailed plastic toy animals such as the high quality Schleich brand which I had so admired. Then I met a family who was raising their children entirely naturally. All their toys were made of wood. All their food was organic. They weren’t vaccinated or given conventional medicine, only treated with plant remedies. The children were the happiest, healthiest, most loved little beings I had ever come across. And I had the privilege of being their nanny! The two year old taught me about the importance of wooden toys. He had a simple little wooden rabbit just the size to fit in your hand. One day we took the rabbit for a walk to see the spring flowers. He let me hold it. I seemed to enter a different world. The wooden rabbit felt like it emanated a kind of calming, grounding, living energy which made me feel a deep inner peace. I didn’t want to let go of the rabbit! He was my friend. I entered the world of a small child holding a wooden toy. A group of nursery children taught me about the joys of loose parts play. I think I “got it” the day I watched two 3 year old girls playing with mud and sticks. When I went closer I saw they were making “sandwiches” by using a stick to spread mud on bits of wood and having a picnic! Another time I watched a little girl arranging a beautiful pattern with flower petals; a group of little ones mixing and sorting a bowlful of wooden loose parts; and two children playing with a pile of nuts in quiet fascination. The very simplicity of loose parts invites children to become totally absorbed in designing, creating, exploring and experimenting. Loose parts can become anything and be played with in multiple different ways, from building and sorting to pattern making, creative fantasy play and mathematical organising. There is no right or wrong way to play; the child decides. Loose parts play encourages flexibility and resilience and taps into self motivated creative thinking. Detailed plastic replica toys, where everything is already put together, leave no scope for imagination. 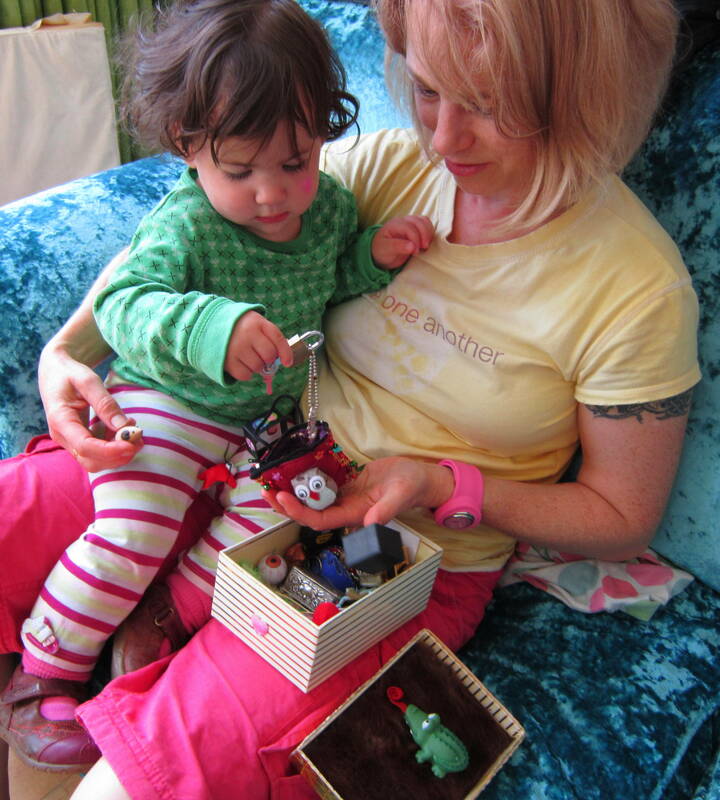 How can the child interact with them, what part of themselves can they immerse in these toys? Added to which, too many designated “boy toys” are destructive rather than creative. The more detail is predetermined, the more distanced the child becomes. The simpler, the more focused and involved. Loose parts are an irresistible invitation! Plastic is bland, inert and has no energy or living substance. Wood and wool have texture, warmth and life. They are from the earth, in tune with the same matter our own bodies are made up of. On a vibrational level, they resonate in harmony with the human soul. I wanted to explore this concept further, so I took time out to have a walk around a local woodland park. It has plenty of trees. I figured that if I could feel the energy coming from a wooden toy, maybe I could discover the source of that energy in a living tree. I walked slowly all around the park, stopping to touch and lean on each tree; to come under the shelter of its branches, examine the texture of the bark and gaze up at this majestic ‘being’ towering over me like a protective guardian. My mind was filled with a primal awareness, echoing the consciousness of a small child. I saw the little hidey holes in the tree trunks where small creatures lived. As I came near to each tree, a humming, vibrational consciousness entered my awareness. Was it the spirit of the tree? I don’t know. This may sound fanciful or hippyish, but this is what I felt. An incredibly deep soothing peaceful and grounding energy, which became stronger the closer to the tree I moved. As I touched the tree it intensified, and thrummed through my body. With this heightened awareness, I traversed the park, noticing the beauty of the wooden sculptures and natural tree forms. I came away with a bag full of beautiful twisty branches, pieces of bark and mini logs to cut into sections and make a natural building set for children. When I began to put together my natural building set, I introduced it to the family I mentioned above. The little boy (now four) and his nine year old sister were ecstatic! “This is the best toy ever!” they exclaimed, as they found dozens of different ways of playing with each random piece. Now I ‘get it’. It is the open-ended nature of these loose parts, these pieces of randomly shaped wood, the simplest toys, that so engages the imagination of a child. It is as if a fire is ignited within them. The joy and enthusiasm I see as the little boy sings happily to himself and exclaims in wonder over his little sculptures and creations, explains it all. In this building set, I try to ensure each piece fits together with any of the other pieces in any number of different ways. I let the children inspire me with their way of using these loose parts in their play. The different pieces of wood can stand all kinds of different ways up and join together to make different little dens and structures. On a side note, a den is an extremely engaging and exciting idea to a child because it harks back to a very primal part of our collective consciousness; that of seeking territory and shelter. Going all the way back to the earliest days of mankind upon this earth, we have an inbuilt instinctual need for the security of our own home space. A child making a den is not just play acting. Whether it’s a clothes horse and a blanket, a stick den in the woods or a miniature den made for tiny wooden figures, it’s an externalising of that deep primal instinct. As the four year old expressed with heartfelt longing the other day, ” I’m so jealous of the little people! Their world is so beautiful! I wish I could be tiny and go into that little world.” We each chose a pegdoll thst represented ourselves and entered our own mini world that afternoon. The experience was magical! We picked flowers from the garden outside and used them to decorate our own tiny garden. We made friends with foxes and squirrels and had our own little wooden houses. So yes, wooden toys are important. They give a child the experience of being grounded and soothed, comforted and energised. I see the incredible tranquility and contentment of children playing freely with simple wooden toys. Totally focused ad engrossed…their imagination running wild. As a child belongs to his family and gains his security from that sense of attachment, wood (and other natural materials such as silk and wool) offer him the same kind of attachment and security of being part of his home planet earth.